Chabla is a revolutionary mobile interpretation service for sign language users, their network and sign language interpreters. With Chabla sign language users have access to interpretation from their smart device at any time anywhere without a delay, in multiple languages. Chabla allows the deaf to make interpreted calls to any number. Once the user subscribes to a Chabla number, they can receive regular phone calls that are interpreted – even if the caller hasn’t got the app. Users can also get ad-hoc interpretation to any F2F communication situation via Chabla. Chabla was created together with Chabla Oy, and IT services company CGI. The team started by collecting domain and problem understanding by interviewing different stakeholders: the deaf, sign language interpreters and interpreter agencies. The most important end users for the service were the deaf, but also other stakeholders were involved in the process. Instant access to sign language services, from wherever or whenever, was nailed as the vision cornerstone. The deaf would have the control and responsibility, and be the actor and subject in the interpretation situation. In addition, the vision was to enable intuitive, fluent and simple communication so that the experience for the user should be “just making a simple phone call” without revealing complexity of the system. The first round of experience prototyping was performed before service journey design was started. The team hacked existing video call services to simulate Chabla use. All the key stakeholder – the deaf, hearing, and interpreters – were involved. Experience prototyping was crucial in understanding and concretising what it could be like using this yet non-existing service, and what are cornerstones and moments of truth of such experience. Service journeys and Blueprints were co-designed both with interpreters and the deaf. Journeys helped to establish and share the understanding of “to be” service process. Designing them together with user groups brought crucial insights – for example the importance of the video quality over the audio. This is the opposite way than normal video call services optimize the calls. First UI concept validation round was performed with wireframes, and the design was iterated based on the feedback. Next iteration included visual design and a prototype that could be tried on smartphone. Development was done using Lean methods and designers and developers worked on the same team, checking the outcome continuously. A pilot group of users was organised from different countries, and the group received latest software versions directly to their smartphones. 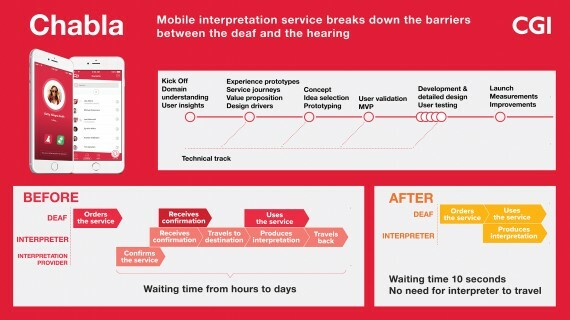 Chabla enables superior access to interpretation services, dramatically shorter waiting times and more flexible and spontaneous way of life for the deaf users. For the interpreters, it results more work possibilities and flexibility in working. For social network of deaf, it means totally new possibilities for communication – the first time in the world a hearing person can make a normal phone call to a deaf.